For the professional basketball player, see Carla Thomas (basketball). Thomas was born and raised in the Foote Homes Projects. 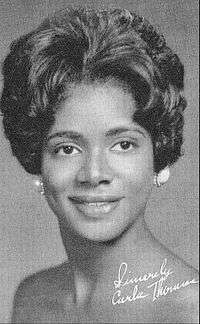 Along with her siblings, Marvell and Vaneese, she was one of three musical children of Rufus and Lorene Thomas. Despite growing up in the projects, the Thomas family lived near the Palace Theater on Beale Street, as Rufus was the theater’s Master of Ceremonies (MC) for their amateur shows. This access not only gave Thomas her first taste of the music world but it also provided a springboard for her transformation into the Queen of the Memphis Sound. In Memphis, the African American centered WDIA radio station sponsored a rotating musical group of high school students called the Teen Town Singers; notable alumni include Anita Louis and Isaac Hayes. Although the requirements to join the Teen Town Singers stated that the person should be of high school age, Thomas became a member in 1952 at the age of 10. She was able to sneak into their ranks thanks to the fact that her father Rufus was an on-air personality for the radio station. This opportunity with the Teen Town Singers did not come without its drawbacks though. As a 10-year-old student, Thomas was responsible for not only attending classes and completing her schoolwork, but she also had to attend rehearsals on Wednesdays and Fridays after school and then perform at the station on Saturday. However, despite this grueling schedule, Thomas thoroughly enjoyed the experience. According to her, “It was a lot of fun, it really was.” She remained with the Teen Town Singers up until the end of her senior year. Although Thomas released albums in the 1990s and in the 2000s, she is best known for the work she completed for both Atlantic Records and most notably, Stax Records in the 1960s. Her first record, "'Cause I Love You", was a duet with her father, with brother Marvell on keyboards, that was released by Satellite Records, which eventually became Stax Records. Recorded when Thomas was still attending Hamilton High School in Memphis, the record drew enough local attention to catch the interest of Jerry Wexler of Atlantic Records. He signed a deal with the owners of Satellite Records, Jim Stewart and Estelle Axton, to distribute "Cause I Love You" and thus paved the way for Thomas’ most famous single, "Gee Whiz (Look at His Eyes)". Her album of duets with Otis Redding, King & Queen, was a number 18 hit in the UK Albums Chart. "Gee Whiz (Look at His Eyes)"
Although this single would eventually chart within the Top 10 on the pop chart and within the Top 5 on the R&B chart, it had an inauspicious beginning. Initially recorded at the Thomas family home, Rufus shopped the song to Vee-Jay Records in Chicago. Vee-Jay never followed through or actively pursued securing the distribution rights. Because of his belief in the song's potential, Rufus returned to Memphis and in the summer of 1960, Thomas would cut the teen love song that she wrote when she was only 15 years old. The song was released by Rufus and Carla in October 1960, to not much fanfare. However, by February 1961, the song was being distributed nationally through Atlantic Records just as Thomas was in the midst of her first year at Tennessee A&I University in Nashville. The success of the single also propelled Thomas into the spotlight, as she performed on American Bandstand. According to Thomas, “The record was young-sounding, romantic and it expressed what a lot of people wanted to say at that age, but still, I was surprised at how well it did”. Not only did this song provide a launching pad to Thomas' first album, but it also gave Stax Records national exposure and label recognition. After her last Stax recording in 1971, Love Means, and an appearance in Wattstax in 1972, Thomas slipped into relative obscurity when compared to her 1960s musical heyday. However, she was featured in a number of modern-day projects, notably including a 1994 compilation of her greatest hits, a 2002 live recording of a Memphis performance and the 2007 release Live at the Bohemian Caverns in Washington, D.C., a long lost live recording of Thomas in 1967. She would also occasionally tour during the 1980s and became heavily involved in the “Artists in the Schools” program that provided Memphis schoolchildren with access to successful artists. These workshops were organized to talk to teenagers about music, performing arts and drug abuse. In 1993, Thomas was awarded the prestigious Pioneer Award, along with such musical heavyweights as James Brown and Solomon Burke, from the Rhythm & Blues Foundation in honor of her career achievements. She was also featured in the 2003 documentary Only the Strong Survive, that was shown at the Cannes Film Festival and showcased important Stax recording artists. Carla’s biggest influence was her father, Rufus. Besides accompanying him during his 'MC' days at the Palace Theater, Rufus also encouraged and believed in his daughter’s ability. According to Carla, “My dad probably discovered I could sing before I did”. He was also instrumental at setting the stage for her Teen Town Singers gig and for actively pursuing and promoting her breakthrough single, "Gee Whiz". Musically, Thomas was inspired by Jackie Wilson and Brenda Lee. Note that Billboard did not publish an R&B chart from late 1963 through early 1965. 1 2 3 4 5 6 Freeland, David. "Carla Thomas – Memphis's Reluctant Soul Queen". Ladies of Soul. University Press of Mississippi, 2001. 56–75. 1 2 3 4 5 "Carla Thomas | SoulTracks - Soul Music Biographies, News and Reviews". SoulTracks. Retrieved 2014-02-16. ↑ Roberts, David (2006). British Hit Singles & Albums (19th ed.). London: Guinness World Records Limited. p. 454. ISBN 1-904994-10-5. ↑ Puterbaugh, Parke. "Where Are They Now – Carla Thomas." Rolling Stone Aug. 10, 1989: 55. ↑ "Rhythm & Blues Foundation - Preserving America's Soul". Rhythm-n-blues.org. Archived from the original on 2014-02-21. Retrieved 2014-02-16. ↑ "Only the Strong Survive (2002)". IMDb.com. Retrieved 2014-02-16. Wikimedia Commons has media related to Carla Thomas (vocalist).